We recommend wearing sunglasses when you are outside, not only is this going to protect your eyes from the suns harmful rays, but it will also help to stop pollen from blowing into your eyes! Also, wearing some slick shades in the Spring is a great look! This is cleanliness 101 people! Always make sure your hands are clean, especially if you spend a lot of time outdoors. 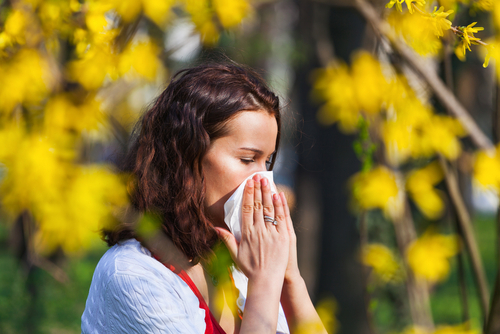 Pollen can easily get on your hands and the average person touches their face a lot every day. This creates a situation where you can rub pollen into your eyes and cause a lot of irritation and redness. Probably not a bad idea to keep some eye drops handy to keep your eyes clear of pollen. Obviously, when you are outdoors you are exposed to a lot of allergens in the Spring, but the indoors can be just as bad. Pollen is so small that it can easily blow through the screens on your windows, so if you regularly have the windows open, expect to deal with the same allergy issues you would deal with in the outdoors. One thing you can do to help reduce the allergens in the air in your home is to get a high efficiency particular air (HEPA) filter. This air filter will help to regular the air in your home and remove allergens. Spring is in the air as they say, just make sure you are taking precautions to protect your eyes from pollen and other free radicals. Most importantly, don't forget to enjoy this beautiful time of year!